Location and Jurisdiction: 15 miles northwest of St. Anthony near Red Road (BLM & State lands). Burning east of the old Red Road Fire. Percent Contained: 0%, Containment estimated for 7/27/18 at 10 p.m. Fuels and Terrain: Burning in grass and brush on flat ground. Fire Crews/Resources: 9 engines (BLM, USFS, BIA and multiple county and rural fire departments) and 3 dozers. 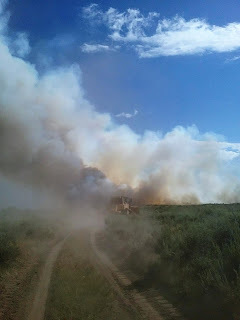 Summary: The Grassy Ridge Fire started on 7/26/18 at approximately 3 p.m. off the Red Road. Fire is active to the northeast burning into portions of the old Red Road Fire. Shifting winds are creating erratic fire behavior, but crews are continuing to make good progress securing line around the fire. Photos: Photos are posted to @BLMIdahoFire Twitter #GrassyRidgeFire and Idaho Fire Info Facebook. Photos courtesy of local BLM and FS firefighters and air attack.